Were established in 1984 and offer a great selection of properties in Jávea for sale near the beach or holiday apartments for rent. Projects like Golden Life;Golden Paradise Golden Gate Golden Port;Golden Beach IIGolden Park and Golden Gardens are just some examples of the Professionality of this company. We have a wide variety of Jávea apartments villas bungalows Town houses and penthouses in the most important areas of the town Jávea..
Search our database to find the the location and kind of property that you are looking for in Jávea or the surrounding area. Our multilingual staff can tell you everything you need to know about buying property in Spain. You need only to select the house that you are interested in and ask us for a viewing appointment. We will be very happy to assist you in the process of bying a property in the Costa Blanca. We offer a great opportunity to invest in the Costa Blanca. Take a look of our new properties for sale in Jávea. 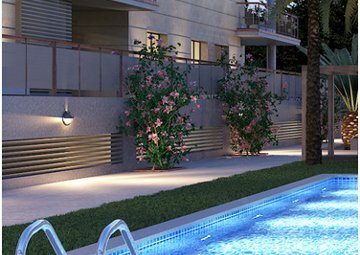 We have brand new luxury apartments and townhouses close to the beach with swimming pools private secure gardens and parking. Jávea is located in the northern section of the province of Alicante between the capes of San Antonio and La Nao. The Cabo de Nao separates the bays of Valencia and Alicante and is the westernmost point of the Valencia's coastline. Visit the Golden Star website!